It’s safe to say we aren’t born with a burning desire to consume green vegetables. If we had the same natural appetite for green veggies that we do for chocolate and Ring Pops, we might be a whole lot healthier. But there are many people who legitimately love the green stuff – we see their photos every day on TwoGrand. It got us thinking: What makes them different? Could we pick green veggie lovers out of a crowd without gauging their reactions to a flawless head of broccoli? We combed through more than 250,000 answers to see what the best predictors were of green vegetable love (and hate). Here’s what we found. 1. The best place to find green veggie lovers is your grocery store parking lot. They’re the ones riding carts to their cars. Yup. The biggest predictor of green veggie love is how much that person enjoys grocery shopping. 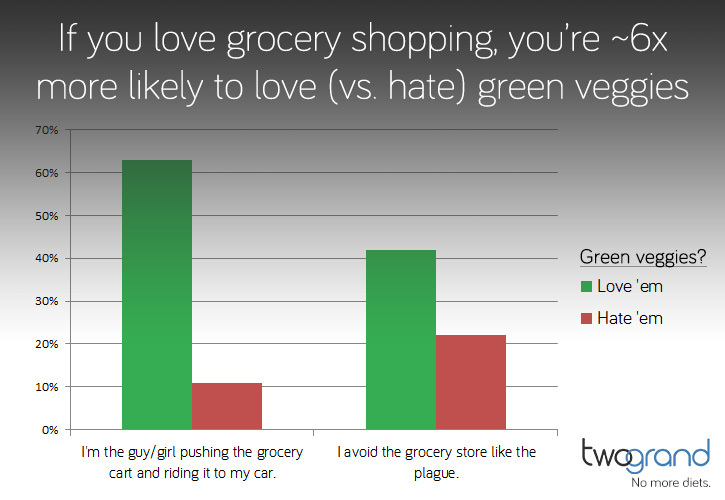 On average, half (50%) of TwoGrand users love green veggies, and half either tolerate them (36%) or hate them (14%). But if you dig for the source of that love and hate, you find that the best way to divide the camps is by affinity for grocery stores. If you dig grocery shopping, you’re nearly 6 times more likely to love green veggies than hate them. And if you avoid grocery stores? Your green veggie love-hate ratio doesn’t even reach 2:1. 2. 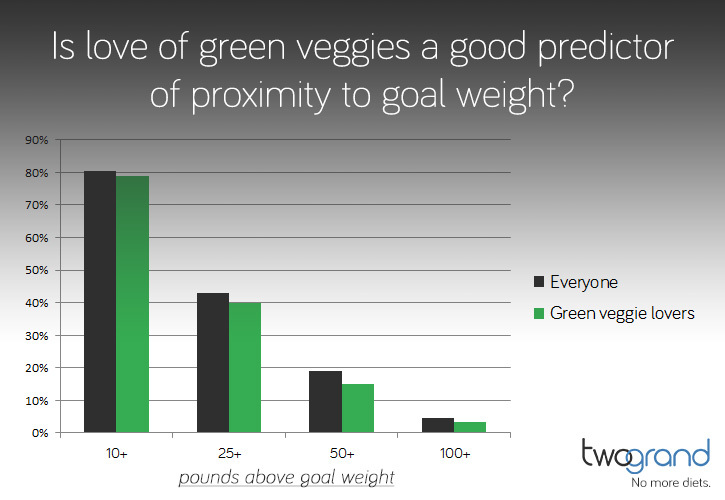 Proximity to goal weight, however, is NOT a strong predictor of green veggie love. 43% of all TwoGrand users are 25 pounds or more above their goal weight. If you love green veggies, that number drops only a little, to 40%. The difference widens slightly at higher weights. And, surprisingly, if you are within 10 pounds of your goal weight, you are no more likely to be a green veggie lover. 3. If you want to find people who DON’T like green veggies, head to your local airport or mall. 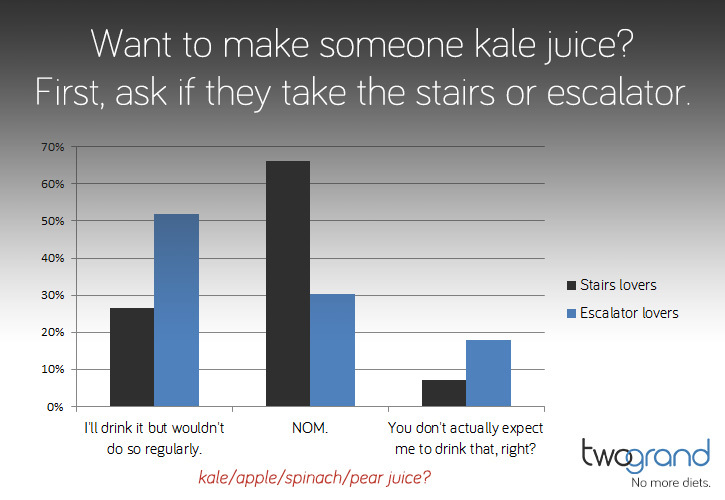 As a whole, 40% of TwoGrand users answer “NOM” while 12% want nothing to do with the green juice. The rest will drink it if forced to. Not very helpful if you’re planning to surprise your party guests with a giant cauldron of kale juice. Alas, it turns out there’s a different question you can ask to get a much better idea of someone’s love (hate) for kale juice. That question: Do you take the escalator or the stairs? Keep in mind we’re talking about correlation and not causation – loving grocery shopping doesn’t cause you to love green vegetables, just as riding escalators doesn’t cause you to hate kale smoothies – but it’s definitely some interesting food for thought. Pun intended. Regardless, if you’re looking to make your daily routine healthier – green veggies or not – download the TwoGrand app (iPhone, Android) today. You can try your hand at the questions above, and start discovering small changes you can make to improve your eating and exercise routine – things that mesh with who you already are. 98% of our app reviews are 4 or 5 stars… and that’s WITHOUT free grocery carts to ride around on. We love you, New Year’s resolution. No, really, we do. Your heart’s in the right place. You’re cheery. Full of hope. And you always show up – year after year after year. But when it comes down to it, New Year’s resolution, you fail. You fail 88 percent of the time. You fail because you focus on the outcome instead of the process. You fail because your outlook is short-term when the road to success is much longer. And you fail because you listen too much to what’s being sold to you, rather than asking yourself what you really need. So we’ve decided it’s best to part ways, New Year’s resolution. Don’t take this the wrong way, but we’ve found someone better. So if New Year’s resolutions are out, then what now? 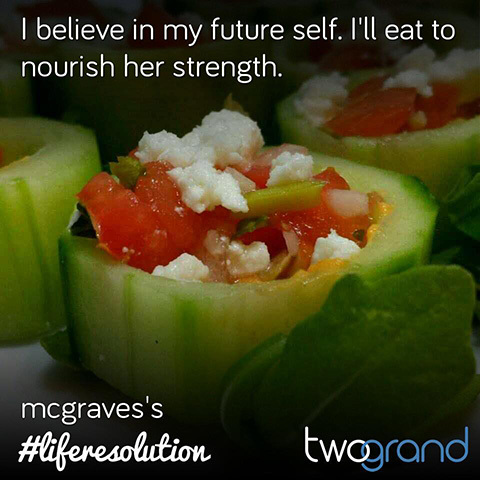 At TwoGrand, we asked ourselves a simple question: “What kind of health-related resolution would actually work?” How can you keep the spirit of the New Year’s resolution, but get rid of all the stuff that holds such resolutions back? The answer came from a simple, but powerful reframing: Make Life Resolutions instead. The annual nature of New Year’s resolutions may be their biggest fault. We all sprint toward that May wedding or that July bikini body, and our behavior modification (if any) follows in a similarly short-term fashion. Habit change isn’t glitzy, and it certainly doesn’t move at a rapid pace. But it works. 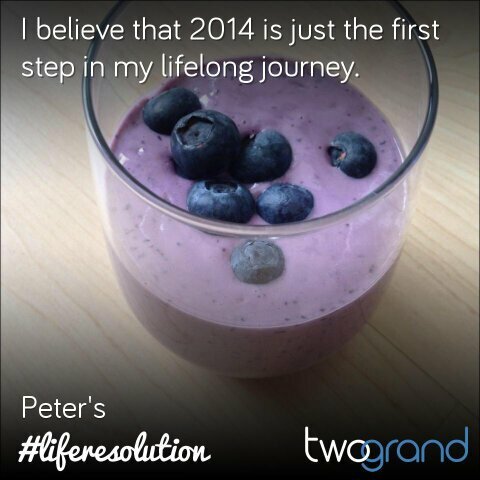 So what if we viewed improving our health as a Life Resolution – good for this year, and every year to come? Still declare your resolution, and start Jan. 1 if you’d like, but erase the end date, and make it about what you believe, so it can always be improved upon. I believe that health is measured in added years, not lost pounds. I believe in my future self. I will eat to nourish her strength. 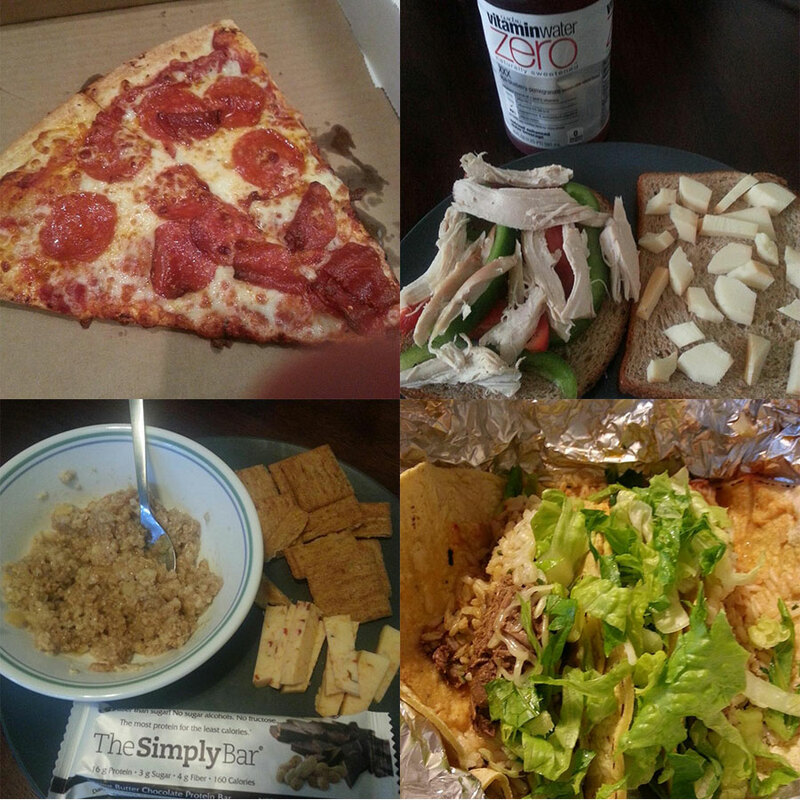 I believe I can eat the foods I love and still lose/maintain weight. These are things we can work toward every day, no matter how much (or how little) we weigh. We can always strive to live healthier. And if doing so becomes our creed, the short-term goals will fall into place along the way. If losing 15 pounds is part of the journey, and not the destination, then we know we’re not done once we get there – even if there are no more pounds to lose. Make your life resolution today. And after doing so, we’d love to see you on TwoGrand. 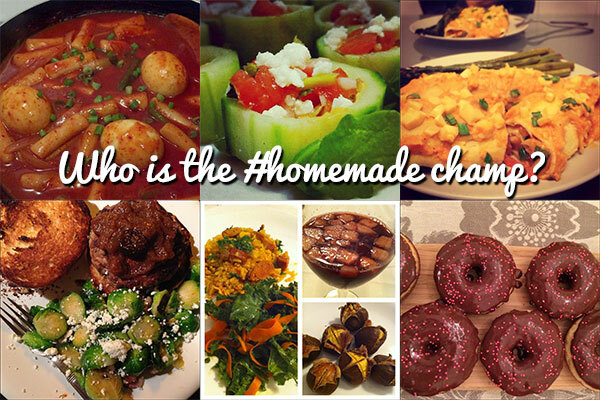 We’re an awesome community of people focused on improving our eating and exercise habits our way. It’s powerful change. You just may find that improving your routine will inspire others to do the same. In the coming weeks, millions of us will make New Year’s resolutions, and almost all of them will fail. It’s the not-so-hidden secret about our annual rite of resolution making. A powerful new PSA – watch it below – forces us to ask whether we’re setting the wrong goals. The PSA presents a simple question – What will your last 10 years look like? – then shows us two scenarios for how one man’s life could look during his final 10 years, split across the screen’s two halves. In one scenario, the man is active, jovial, healthy. In the other, he’s bedridden, lonely, sick. It’s a powerful reframing of goal-setting, and timely, too. 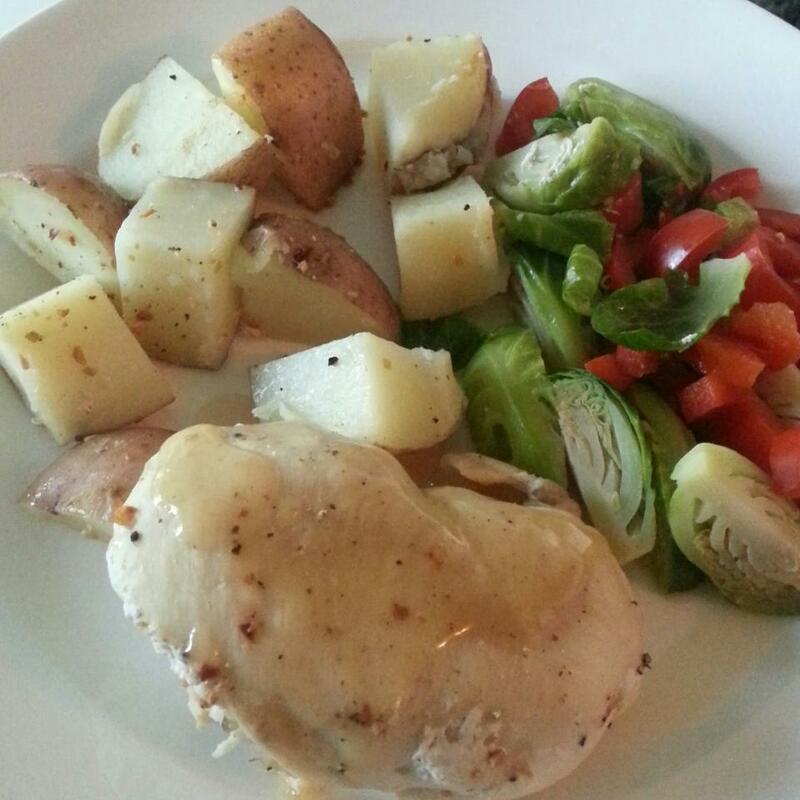 Rather than strive to lose 10 pounds, as so many of us do – just look at Twitter – we should strive to add 10 years. Happy, healthy, fulfilled years. That’s not a New Year’s resolution. It’s a life resolution. And it’s exactly the kind of thing we built TwoGrand to support. It’s that time of the week, when we release our newsletter Email of Awesomeness into the wild. Our commitment remains the same: Deliver awesome content to your inbox around 2 p.m. PST every week – stuff that’s worth you taking five minutes out of your Wednesday (or Thursday!) to read. 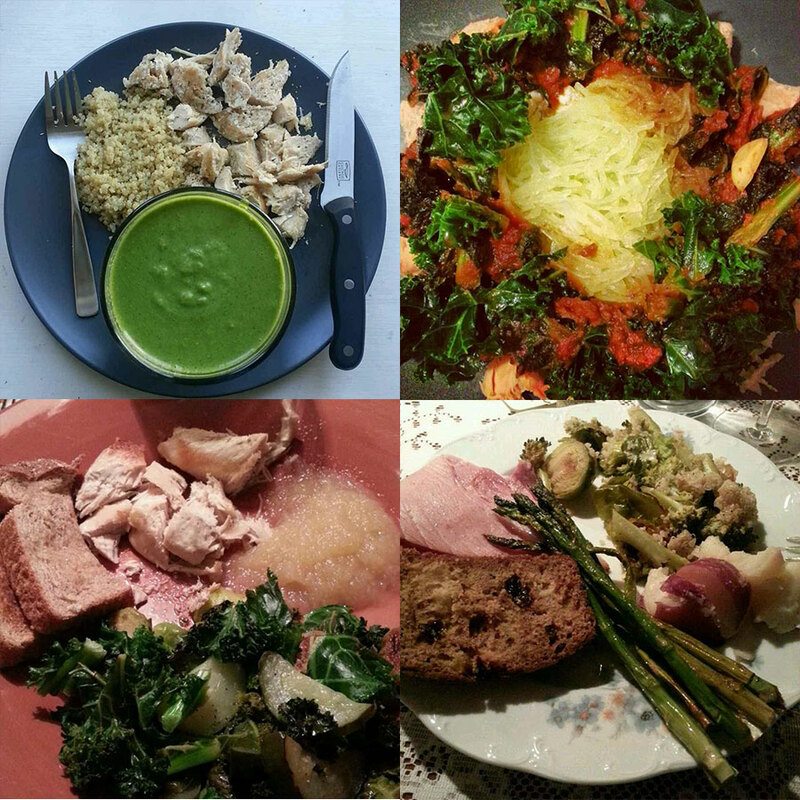 This has been a big week on TwoGrand – our exercise feature was released, we had a killer #homemade meal competition going on, and we saw a record number of meals logged. Read the email in all its glory. 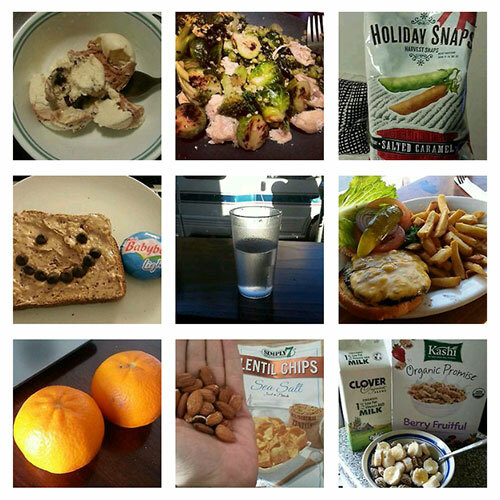 When calorie counting, you’re aiming for the number of daily calories required to achieve your goal. As discussed in our last post, there are myriad issues with the practice of calorie counting – which is why we don’t recommend it – but the science of calories in, calories out still makes sense. Turns out there is a way, and all it requires is a simple grammar reversal. Standard calorie counting logic says X calories per day allows a person to be Y pounds. If this is true, then the reverse must also be true: a person is Y pounds because she consumes X calories per day. 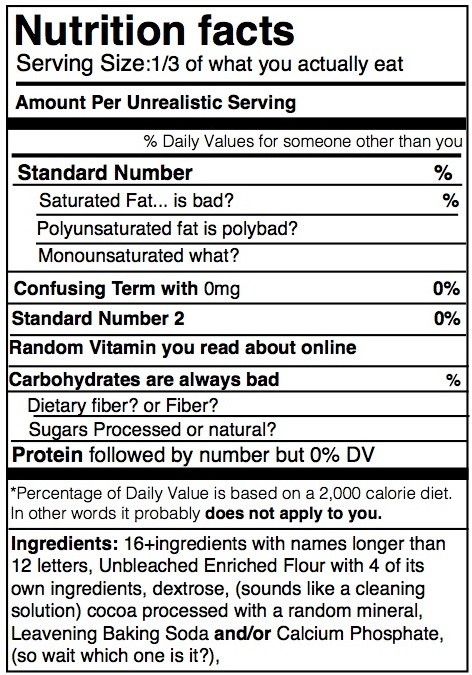 And in the latter case, the calorie number (X) is just a detail. So let’s rephrase it: A person is able to maintain a weight of Y pounds because he consumes the right amount of calories for that weight. By employing some clever syntax changes, we’ve taken the focus away from counting calories and placed it on the individual and his daily routine – all without violating the scientific principle of calories in, calories out. If a woman is able to maintain a weight of 130 pounds, then she must be consuming (and burning) the right amount of calories for her body to stay at 130 pounds. Her routine enables her to maintain that weight. Whatever she does is right for her maintaining her weight. So if I’m very much like her – similar age and height, similar body type, similar activity level and lifestyle – then if I can mimic her eating routine, I should be able to progress toward her weight. This idea is a large part of TwoGrand’s philosophy. There are different foods and routines that work for different people, and by understanding more about you and your body, lifestyle, and preferences, we can help you learn what works best for you. All of the science, in a fraction of the time, with focus on making good (and lasting) changes instead of a daily calorie target. Sounds like a great trade-off to us. A one-day snippet of the routine that enables one 26-year-old, 158-lb, 6’0” and lightly active man to maintain his weight.